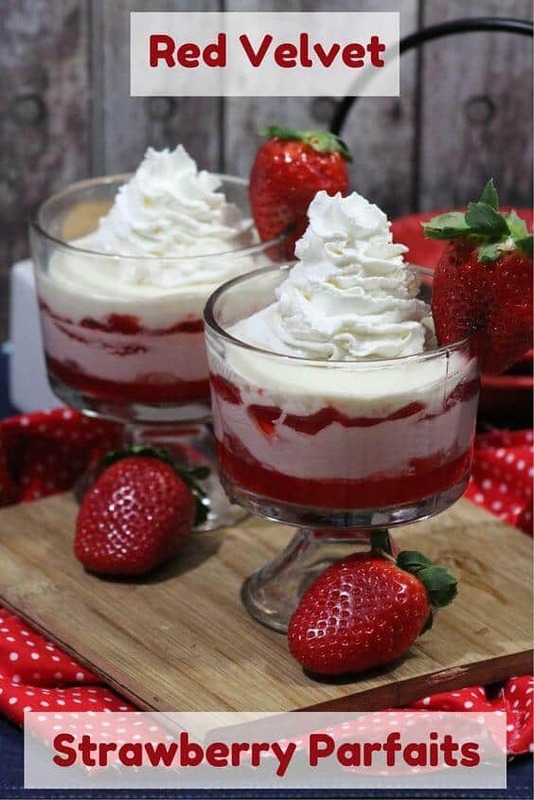 With fresh strawberries, ricotta, and crumbled red velvet cookies, these Red Velvet Strawberry Parfaits are a delicious dessert perfect for Valentine's Day of any day of the year. The recipe is broken down into two parts, as making the red velvet cookies is necessary before making the parfait itself. Ingredients and directions are below, enjoy! With fresh strawberries, ricotta, and crumbled red velvet cookies, these Red Velvet Strawberry Parfaits are a delicious dessert perfect for Valentine’s Day of any day of the year. Whisk together cornstarch and 1 cup powdered sugar in small bowl. Add cake mix, butter, and eggs. Mix until well combined. Using an ice cream scoop, scoop batter and drop into powdered sugar. Roll into balls covered with powdered sugar. Place on baking sheets about 2 inches apart. Bake at 375 degrees for 9-11 minutes. Allow cookies to cool on baking sheet for a few minutes, then transfer to wire rack to cool completely. Once fully cooled, break cookies into crumbles and set aside. Place strawberries and sugar in a bowl; toss to coat. Place in the refrigerator for 30 minutes to chill. Assemble parfait by scooping red velvet cookie crumbles in the bottom of the parfait glass. Follow by a layer of ricotta and a layer of strawberries. Then, repeat the three layers (cookie crumbles, ricotta, strawberries). Top with whipped cream and garnish with a strawberry on the side of parfait glass, if desired. for my next family gathering Thanks for the recipe. 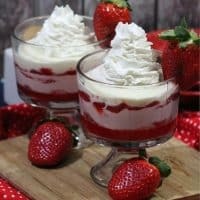 (Red Velvet Strawberry Parfaits Recipe) I am going to make this for our Easter family dinner get together next weekend. This recipe sounds so good to me. I came back to this recipe and wanted to comment that it has been tried and is so good that even the picky eater of the bunch ate it and smiled. I gave it 2 pins and a share, Thank you, Have a wonderful day! This recipe looks really scrumptious! Thanks a lot for sharing. What a cool recipe! I had never even heard of combining strawberries and red velvet. This will be an ideal surprise treat for my little sister. Those are two of her most absolute favorite sweets! They look beautiful and delicious. How can you go wrong! Yum! I love parfaits, but have never had one so rich! They are so pretty and sound delicious! 🙂 Thanks for sharing! Toss some blueberries in it and you have a 4th of July dessert. I love strawberries, and these look absolutely delicious and perfect for summer! Thank you for sharing. I love anything with Strawberries in it. These look so yummy, can’t wait to try these. Thanks for sharing! I love strawberries and I know this would be a big hit when I make it. I’ve never had red velvet and strawberries together. I’d love to try this, it is easy with the mix. and recipes with ricotta are my favorite desserts!